The Royal coronets were defined by a Royal Warrant of 19 November 1917. - The heir-apparant shall have a coronet composed of four crosses patèe and four fleurs de lys, surmounted by a single arch with orb and Cross. - The sons and daughters of the heir-apparant shall have a coronet composed of two strawberry leaves, two crosses patèe and four fleurs de lys. - The sons and daughters of the Sovereign, which includes brothers and sisters of the Sovereign shall have a coronet composed of four crosses patèe and four fleurs de lys. - The sons and daughters of sons and brothers of the Sovereign shall have a coronet composed of four strawberry leaves and four crosses patèe. - The sons and daughters of daughters of the Sovereign with the style of Highness shall have a coronet composed of four strawberry leaves and four fleurs de lys. From "Royal Heraldry of England", J.H. & R.V. Pinches. This is a very silly question, but how is a coronet different from a coat of arms? A coat of Arms is a heraldic device specific to an individual eg to Queen Elizabeth II. The Queen Mother Memorial Statue on The Mall has a lovely rendering of Her Late Majesty's Coat of Arms. The Royal Arms of The United Kingdom also feature on the Statue of King George VI. 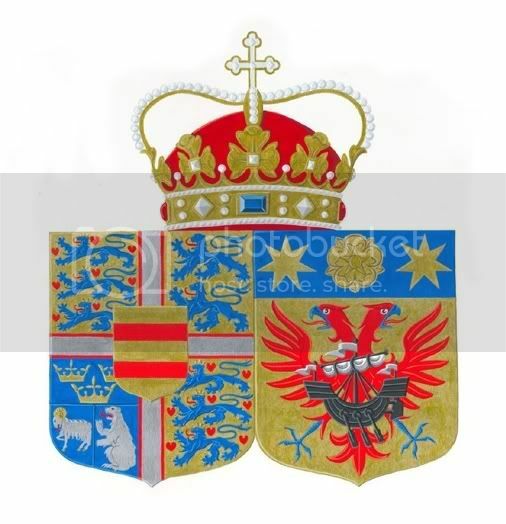 The main reason the shield of the Coat of Arms of HRH The Duchess of Gloucester appear at the centre [or honour point] of her husband's Arms is that it was Granted directly to Her Royal Highness and was not inherited from her father. Firstly, HRH is Danish and her father was a foreign national, not of British descent, and therefore not entitled to a Grant from the College of Arms in London. Secondly, HRH's parents had long been divorced before she married the Duke. I believe HRH's maiden name of Van Deurs is in fact her mother's maiden name and that her father had little to do with her. These Coats of Arms are slightly out of date as the father of Capt Mark Phillips has since passed away. The shield with the five-pointed label was Peter Phillips' Coat of Arms when his grandfather was still alive. However, he has taken over the three-pointed label and Capt Mark Phillips uses the Coat of Arms with no label. As for Zara Phillips, I was assured by the College of Arms that, as originally the only female descendant of the original Grantee, namely her grandfather, then she was entitled to bear the Coat of Arms on a suitable shield for a woman [namely a Lozenge as here or an Oval] without the label. In fact, now that Peter and Autumn Phillips have a daughter, Serena, the above arms are actually hers. Actually, Mr and Mrs Peter Phillips' daughter's name is 'Savannah,' not 'Serena.' Miss Phillips was christened earlier in the year, and, as far as i know, no middle name/s have ever been reported to the public. She was christened Savannah Anne Kathleen Phillips and now has a younger sister, Isla Elizabeth, who was born sometime last year. FYI- Ironically, Mrs. Peter Phillips and HSH Princess Grace of Monaco were born Autumn Patricia Kelly, and Grace Patricia Kelly, respectively. Hi, does anyone know the reason why Diana after her divorce had a royal coronet on her coat of arms?